Book Lovers Life: Audiobook Review: Quietus by Bobby Akart! 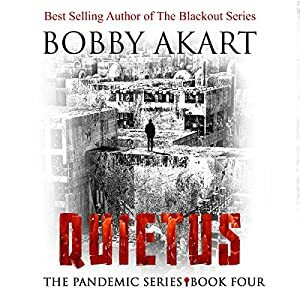 Audiobook Review: Quietus by Bobby Akart! Quietus est... he is quit.There is no such thing as an ending, just a new beginning.Throughout the millennia, extinction has been the norm and survival, the exception.When faced with the hour of departure, will mankind fight to survive?Not only was there a patient zero, there was also a last patient.A new dystopian, post-apocalyptic fiction series from author Bobby Akart (The Blackout Series, The Boston Brahmin series, and the Prepping for Tomorrow series). The events depicted in The Pandemic Series are fictional. They are, however, based upon historical fact.In Beginnings, book one of The Pandemic Series, a deadly plague virus has been introduced across the glove by ISIS terrorists who are waging the mother of all wars - The Final Jihad. Dr. Mackenzie Hagan, a disease detective and epidemiologist at the CDC-Atlanta and Nathan Hunter, an off-the-books operative for the mysterious Project Artemis within the Department of Defense, join forces to both identify the disease, but also to locate its source.In The Innocents, book two of The Pandemic Series, ISIS terrorists continued to wage the Final Jihad, infecting innocent people around the world. The highly contagious form of the plague has been genetically modified - to be the perfect killer.In Level 6, book three of The Pandemic Series, the pandemic has hit a brick wall, but not because it's burned itself out. Rather, it's running out of victims. Social distancing is the only way to avoid a gruesome fate. Unfortunately, in a dystopian world where resources are scarce and scavenging is a way of life, every moment away from where you live could result in your death from either the disease, or your fellow man.Quietus concludes The Pandemic Series. For Mac and Hunter, and all mankind, there is no means of avoiding the final death blow brought about by the spread of the deadly plague. I must admit, I finished this last week and can only write up my review now! The simple fact is... I'm not ready for this to be over, I'm not ready to say goodbye to these characters, I just couldn't gather my thoughts enough to actually sit down and put into words what I felt!! Plus it's been super busy at home and I didn't have an hour to sit and do this review. So, here we are at book 4 and these characters have firmly cemented themselves in my heart. After the ending of the last book, I eagerly dived in to see if that character survived!! Well, I'm not going to say because that would be a spoiler ;) Anyway, this one sees Mac racing to find a cure or a vaccine for the plague, Hunter is called to action, there's an egotistical man who is trying to impregnate as many women as he can, his sons are kidnapping girls and bringing them to the mountain, poor Janie ends up as a victim and Mac needs to try and save her before it's too late. There's an awful lot more happening but I can't get into it because it will spoil everything!!! Plot wise, I found this one to be more action packed and thrilling than the previous 3. All along the story has followed the progression of the plague and the characters, this one has a lot more tense scenes, a lot more edge of your seat action and a lot more suspense. I few through it and didn't want it to end. Again, as with nearly all of this authors work, the characters are awesome. Mac is driven, smart and not afraid to do what's needed. I loved what she did at the end, and I felt like it stuck true to her character. Hunter meanwhile, shines a bit more here. He is a badass and I'm glad he got to be one again!! Each character was well written and developed and are firmly on my favourites. I really didn't want to say goodbye, and with the way the book ended, I'm hoping we may see them again!! In all, this series is fantastic. The level of detail and research that went into it was phenomenal and it showed. The author has created a scenario that is feasible and one that frightened me. It's a series that made me think and opened my eyes to how easy it would be for a pandemic to happen. Seriously.... go read this series, you won't be disappointed!! Narration wise, it's 5 star all the way for John David Farrell. He read the book extremely well, was easy to listen to and follow, and had plenty of tones and voices to make this an enjoyable listen. Kris Adams is a 4 star rating, simply because she didn't differentiate the females enough. She has a pleasant voice and reads the story well, it's just that all the girls sounded the same!! The Rains by Gregg Hurwitz Review! Joined by Mara Gan Book Blitz and Giveaway! Curse of Weyrmouth by David Longhorn Review! Audiobook Review: Dark Hunt by Grace Hamilton! Ambrose Ibsen Author Feature and Giveaway! Audiobook Review: The Hunted Tribe by Roma Gray! Audiobook Review: The Orphans by Mike Evans! Rick Chesler Author Feature and Giveaway! Audiobook Review: Forest by Ambrose Ibsen! Audiobook Review: Haven by Tom Deady! Audiobook Review: Purgatory by A.I. Nasser! Audiobook Review: Refuge by A.I. Nasser! Collecting Death by Ron Ripley Review! Horizon by Fran Wilde Blog Tour and Giveaway! Audiobook Review: Kurtain Motel by A.I. Nasser!